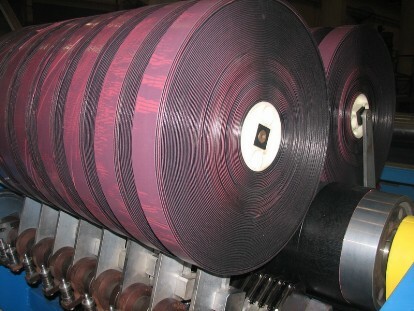 Slitter line for production of rubber strips is designed for cutting of wide rubber sheet bobbins into many narrow rubber strips, each wound on a separate core, for further application on top of breakers in the steel cord cutting lines. Machine has fully automatic operation and can produce rubber strips from 20mm up to 300mm of width at speed up to 30 m/min. Active guiding system from BST provides for precise centering of the material before cutting. 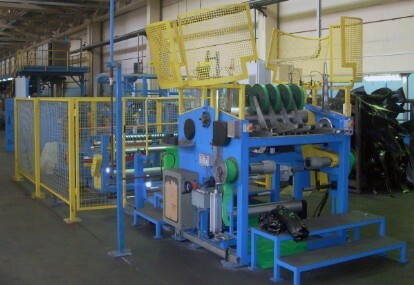 Slitter Lnes can be also provided for cutting and winding of the rubberized fabric strips as a stand-alone lines or in-line with the textile bias cutter line.